Evan Nehring: Could Your Life Change Forever by Midnight? Could Your Life Change Forever by Midnight? ...and you get on it. ...and I get on it. Another way of saying this is, if you get on the path and stay on it, your destination is assured. You're as good as there. My decision to write a book came after all my other life paths brought me to that place. I had spent my life pursuing God's best for me and helping others. I watched as my kids prepared to leave home. I had to say all I needed to say. God has brought you to today. If your chosen destination is random, it's not God. I've put together my online platform and my writing project almost completely while my family is sleeping or otherwise unavailable. I work full-time and then love my family before working into the night. Your destination may cause you to work overtime. If we are going to be people of faith, then faith is not optional. Our faith is ultimately in Jesus, but he leads us on a road that requires faith for all kinds of things. So we look at the map of our life and say, "Holy Spirit, show me the destination that you created me to find." Our destination is our destiny. How can your life change forever by midnight? You can pick. Are you looking for a man or woman to spend your life with? Today you say, "Holy Spirit, I invite you into this choice." Then you write down what he tells you about your future spouse. Is your spiritual life mostly random and empty? Hit your knees today and say, "Jesus, I choose the path to you. Please show me the way." Is it your career? You can pick! Decide today on what is important to you in your work life, and set your course. If you can't choose, then that's your next choice: to get on the path to your decision. So what do you think? Am I nuts? Does stepping on the path mean your life is already changed today? Care to share a life change you choose by midnight tonight? I like this. I would like to be more focused rather than going through the day to day in a random way. It really is as simple as making the choice, daily. I agree that fear holds us back. Yes, maybe the road leading to the decision is asking, "God, is this a legitimate concern holding me back, or do I just need your courage?" And on the "I don't know where I want to go" point...again, totally true. Maybe the decision point is to say, "God show me the destination for this week, or this month." And then, step back to choose again. Great point on the perseverance! Great point on the daily choice. It is just so amazing that God is available for EVERYTHING that we do in our lives! Honestly, after reading this post I started thinking about areas in my life that I definitely have made God a part of, and areas in my life that probably could use more help from Him. To keep from a long list of stories, the areas in my life that God is in the driver seat are less stressed, more fun, and more clear. I do, however, feel the need to point out that sometimes God's words are not always what I expect to hear. It is a challenge to invite God into EVERYTHING in my life. But hey, being a follower can be difficult. Difficult tasks often lead to working harder and trusting more, which in turn usually results in amazing conclusions. All in all, push forward with what God is challenging you with, and see where it takes ya :-). "Not always what I expect to hear." Right. Like we get on the path and we grow and change on the way. God says, "This city would be way cooler." Hopefully we're in a place where we can say yes. Everyone may think it is easy to wander through life without a goal or destination, but there is great stress that comes with not having a purpose. You end up not knowing what you want, and sometimes, not knowing how to make decisions. An important part of life is setting a goal or destination, of making that choice, "What road am I supposed to be on?" Whether you are a Christ follower or not, everyone needs direction. It gives a needed sense of purpose. It helps you mature. Can you change your life forever, by midnight? I think so. Challenge yourself. Give your life a direction, a sense of purpose. Listen to what God wants for your life, His perfect plan. Trust me, He knows better than we do. I constantly remind myself of this. 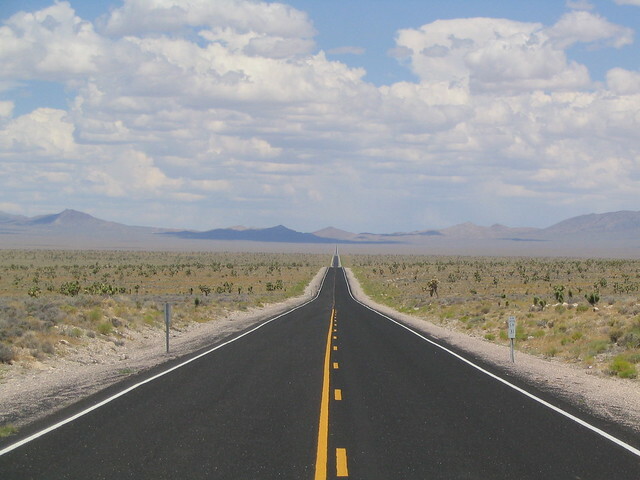 I am on the road to help plant a church in Reno, NV. This was one of my wife and my choices. The path to which we were led. It is satisfying having a known purpose, to have a goal or path to follow. And getting there is the adventure! Listen to the Spirit and you will know the direction you are supposed to take, even if it doesn't make any sense at the time. Wow, great road, inthesteadofhate! (great screen name too)I love the listening to God emphasis. Godspeed your adventure. Please stay in touch. I think the internet works in NV. Change my path by midnight? Interesting you should bring this up today Evan. As many changes are happening in my life at this moment, the one that has been a hard one is to move or not to move. I know that it is a matter of time, it is when God's planning is right. And I decided today that yes, it is going to be for sure this summer. Haha. What if you totally believe that you are on the path in which you picked is the one that God has planned for you and as your heading down this path happy and doing well and BOOM God had a different plan for your life? Did I take that many detours in the path in which God planned and He had to bring me back to this one? Or was that the plan all along? I mean I was happy doing my lab work, going back to finish the program to be a complete lab geek. Now, well you know for the past few years from working in the family shelter to youth, to slowly getting His Will up and running. Never did I think that God would use me in the ways in which He has in the past few years. Luke 1:37- Faith it does not make things easy, it makes them possible. Knowing this with faith is unbelievable. I could not make it through without knowing and believing in Faith. I have total Faith that God leads me where He wants me to go. Do I plan my life. Plan for the days ahead and leave it to God to show the way. "As much as you want to plan your life, it has a way of surprising you with unexpected things that will make you happier than orginally planned. That's what you call God's Will". We all have a purpose in life. No matter who you are. Finding that purpose is a great feeling. Evan I am sure finding that you knew to write a book was a wicked feeling. Finding to know to build a church (your friends above me) that would have been a wicked feeling as well. A decision to get a job, or move down the street or go back to school.. wicked awesome feeling. It has been a life change for sure to get His Will up and going. Who knew I had any business sense in me at all? God did. Again, I agree we can change our life forever before midnight. It is up to us to do it though. And work at it and leave it to God as well. If that makes sense. Everything happens for a reason. Sometimes that reason may not be known to us at the time, or never it might be apart of someone else's story. However, at the end of the day it will all make sense, cause God has a plan for our life. Every day is a new beginning. We can change daily, and work through everything daily one step at a time to get where we want to be. Like you said, change your life forever by midnight. Just got to do it! Nothing is impossible. Agreed totally with you! As always enjoy your writing, thoughts come to mind. Something to think on for the week. Thanks Evan. "Faith is not optional" sums up my thoughts completely! In choosing a destination I think most of us consider bad weather and detours. But who in their right mind plans on a life altering accident? Sometimes those "change by midnight" moments can be devastating and faith is essential. Henry David Thoreau said, "Pursue some path, however narrow and crooked, in which you can walk with love and reverence." If these two things are at the core of our center we can make the journey. And if we skid in sideways dirty, damaged, and drained we can still smile and shout woo-hoo what a ride, I loved God and lived! Carol, love the Thoreau quote. Has a God ring to it, intended or not. The what a ride philosophy is interesting too. I make mention of that in my book project...in the intro, I think. Yes, sometimes faith is getting to your destination and sometimes faith is comfort on the roadside. One is more fun, but both are needed, eh? Wow. Some thought-provoking stuff, Evan. It's really interesting to me that even though we think we're done, and our lives have been changed, God isn't finished with us (or we'd be home already). All this brings me to an honest question. What if you don't know what God wants? Or you think you know and aren't sure how to go about it? God has given me some really specific calling recently (really when I look back it was many years ago but I think I'm just starting to hear Him clearly). I haven't the faintest idea of how to proceed. Oh, I'm praying, I'm seeking His will in His word, I'm seeking Godly counsel, all that - do I need anything else? I'm a big fan of journaling when it comes to sorting out God's voice and practical wisdom. It's very hard to work all that through mentally. Stressful. Writing it down and getting it out on paper or Word document helps me. The other thing is having some long talks with a friend who shares your values and gets you. Those are the moments when investing in those friendships can be a real life saver. By the same token, when I get to that place of needing a listening ear and find that it's not available, I know I need to get back into relational mode. Hope your opportunity turns out great! Just as someone above mentioned, it is really amazing that the discussion is revolving around a life change forever by midnight. I have been on a path that has seemed to take me down some dead end roads, where I have had to turn back and start again. There have been days I have wanted to give up, days I have given up; only to have God remind me of the dream He planted in me long ago. While I may not know the timing of this, I do believe that God will bring this dream into reality. It is great to hear someone elses dreams and how they have pursued them. I can totally relate to the working a full time job, spending time with family, and then working into the late hours of the night to see a dream come true. I will be praying for you as you pursue your dream. Thanks sis! I know I'm MUCH older than you, but the years move on for all of us. If we don't get on a path by midnight, what regrets will we carry? Funny, I find myself feeling like I really need to take opportunities to catch some TV time with the family. Our pendulums of life balance swing back and forth a bit wildly sometimes. Thanks for the kind words, Heather. Anyone who says "my family is way more precious" obviously has an awful lot of wisdom! A very enjoyable, thought provoking post! Good work. I made the goal today to daily press into Christ in a deeper way that allows time for a real spirit to spirit connection with him. You know, something thats beyond reading a few scriptures or throwing out a prayer request. I want to take time even if its a few minutes to really connect with the presence and person of Christ. Thanks for helping me do that with your post. Mike, I'm going to follow your lead on this and get specific on a new "life change by midnight" goal. I want to be more intentional and consistent with discipling my kids. Google spell-check doesn't even recognize "discipling" as a word! Really, this whole blog is for my kids, and for all kids leaving home and trying to follow Jesus. I've been hit and miss on the home front, though. I choose, with God's help, to be great at this. This makes me think of conversations my wife and I have had a few times - actually, we just had one about this the other day - Many Christians are afraid to make decisions (or choose a path) without saying "God told me" or "God is leading me" or "I believe God wants me to." Now if you know for sure God said "do this" or "don't do that" to you (using the Bible as our guide 1st to make sure it is Him we are hearing) then that's okay (you don't have to tell everyone, though). However, no where in the Bible does it say that we can only do things or go places if God tells us to. Why then do so many Christians talk this way? With that Even, I'm glad that you didn't even go there. I can not think of where it is, but in one of Paul's epistles there is the line (very paraphrased but contains the concept) basically telling us that it's okay to choose what we want to do where (he says go to a certain city to do business), but if it is not okay with God he won't let it happen. So I'm saying that for those believers that don't know if God said "do this" or "go there" it is OK per his own Word to just "go" or try "doing" something - as long as it's in line with his word (e.g. Do not become a pimp, drunk, etc.). There's no need to over-spiritualize everything because everything for us should be equally spiritual - whether we say "God" in the same sentence or not. I hope this came out right. Thanks Brian. Nice to hear your thoughts again. For sure, finding God's will is a mix of staying spiritually attuned and using the common sense he gave us! Talk about clarification! Well said!